I am extremely grateful to have been among the students supported by Fondo Studenti Italiani; I couldn’t have experienced this life-changing year without it. The medical career is often very structured and very straightforward; not much room is left for vision an imagination, especially in the early years of medical school and residency. I always thought that there are no limits to the contributions we can make, and being able to attend Johns Hopkins Bloomberg School of Public Health (JHSPH) just proved that anything is possible. During this year I have been focusing my interest and studies on humanitarian interventions and health in crisis. One of JHSPH Alumni told us to concentrate our energy and efforts around issues that “break our heart”. Therefore, throughout the past year, with my classwork, practicum experience and winter break travel, I have been working with refugee populations, trying to improve current responses and programming. No matter what the specific topic of interest may be, the MPH has taught me how many skills we should aim to acquire in order to have an impact on this world. I have been exposed to the role that policy, governance and financing play in global health. Furthermore, JHSPH has far exceeded my expectations in terms of personal relationships. I found Professors to chat with about global issues and incredible friends that have changed the way I look at things. They fascinated me with their problem-solving skills, humility and life experience. I attended a variety of courses to broaden my knowledge and understanding of global health in all its different aspects, including biostatistics and epidemiology, policy and advocacy, and health systems (see Table 1 for a detailed list of courses). However, I focused my attention on humanitarian interventions through the MPH concentration in Health in Crisis and Humanitarian Assistance, and I pursued a Certificate in Health Finance and Management. Additionally, in July 2014, I attended the summer course on Mental Health in Complex Emergencies at Fordham University in New York. From September to December 2014 I spent around 200 hours working with International Medical Corps in Washington DC (see Table 2 for description of Duties and learning objectives), whose mission statement “from relief to self-resilience”. International Medical Corps is an experienced leader in responding to mental health and psychosocial needs in the context of humanitarian crises, strengthening mental health systems, and informing national policies in the longer-term development context. International Medical Corps is currently working in about 30 countries and specifically implementing Mental Health and Psychosocial programs in 15 countries. The mission of the organization is to build sustainable local capacities and provide comprehensive, integrated and community based mental health services and psychosocial support activities that promote the resilience, and overall wellbeing of vulnerable refugee, internally displaced and host populations. • Represented organization at public events (including presentation of organization’s work and vision). This has been an enriching experience that led to an ongoing collaboration. 4. To provide recommendations to strengthen cooperation between various actors dealing with child and adolescent MHPSS, and guidance around future activities to strengthen child and adolescent mental health in the refugee operation. I travel to Dadaab in Northern Kenya, where five camps have been set up, of which three (Dagahaley, Ifo and Hagadera) were established in 1991/92, and two (Ifo 2 and Kambioos) in 2011. The vast majority of the refugees (96%) are from Somalia, with most others from Ethiopia. Data show that children and youth constitute 60% of the total population in Dadaab (about 214,300 children in November 2014). In refugee settings, people with mental health conditions are often “invisible”, are not likely to be identified and tend not to be included in assistance programs. All of this is even more true for children. During the first part of the mission (10 days) I conducted the needs assessment on child mental health through key informants interviews. I visited the camps and the facilities of UNHCR implementing partner NGOs in the five camps, had meetings with the focal points for MH activities and informal interviews with refugees. The second part of the mission (7 days) focused on the analysis of the needs assessment and the development and organization of four trainings. Given the prolonged displacement situation in Dadaab, both the WHO mhGAP Intervention Guide training material and the pre-final draft of the WHO/UNHCR version for humanitarian settings have been used as resources. The training aimed to build capacity in technical and refugee staff. 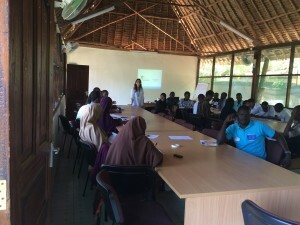 Participants were 6 psychosocial counselors, 4 clinicians from three of the four health agencies (IRC, MSF, RCK) and CVT, 33 community workers (CHWs, social workers, rehabilitation workers, animators and mental health assistants), and 10 primary school teachers. The training focused on epilepsy in childhood and behavioral disorders in children for all the participants, with adaptation of content based on the role of the trainees. One additional module on developmental disorders was included in the training for community workers and teachers. The training for teachers focused on understanding of basic child mental health conditions, awareness raising, suggestions for inclusive education, and how to create a healthy psychosocial environment. The last part of the mission (4 days) aimed to develop recommendations and provide feedback to partner organizations actively working with children. With this purpose I participated to the MHPSS working group meeting on the last day of the mission. A summary of the needs assessment, recommendations and outcome of trainings will be provided for internal use to UNHCR. This has been an amazing experience for my personal and professional development. I found inspiring motivation in the people I worked with that have been serving in Dadaab for many years, never letting themselves be overwhelmed by the magnitude of the displacement and needs. In such settings one can feel that nothing that is being done is enough to really make a difference, but the people in the field reminded me that even though public health is about “millions at a time”, every person that you can help also makes a difference. In February 2015 (February 25th – March 1st) I participated to the Global Health Innovations Fulbright Enrichment Seminar in Lexington Kentucky. The seminar was an opportunity to discuss with fellow fulbrighters about important themes, but most of all to connect with international professionals from all over the world and share experiences. Additionally, we were able to travel to a non-touristic destination to get deeper into the American culture and perform some community work. Moreover, throughout the year, the Institute of International Education (IIE), in collaboration with Fulbright, organized different events to network with peers from different fields and to get to know one another in amazing locations. I will always cherish the opportunity I had to spend one year living in a different country to attend one of the most prestigious Universities in its field. I met incredible people, and have built personal and professional relationships that will last a lifetime. The program enabled me to jump forward in my career, both by allowing me to gain the education I needed, and connecting me with people that work in my field of interest. I have been back in Italy for 6 months now, and I immediately saw the professional advancement that the program has given me, and the doors that are opening within the UN and NGOs worlds. Since I came back I have been consulting for UNHCR and the WHO. This is only the beginning! I am looking forward to start applying my newly acquired skills and making a difference. Someone at Hopkins once told me that “the best reward is to open doors for the next person, and help them see that any dream is possible”. I plan to do so from now on. Thanks to this experience I feel at the same time empowered and responsible for trying to make this a better world supported my cohort of future world leaders.